The Adidas Cup Fall Classic is a competitive tournament, hosted on fields in Tarpon Springs and Brandon. Held in September each year, this tournament is a great way to prepare for the fall season. This tournament is open to all U8-U19 competitive teams. 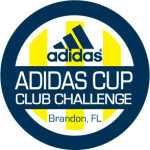 The Adidas Brandon Cup is Florida’s longest running recreational only tournament. It is held in February each year and is open to all recreational level teams in the U7-U19 throughout the state. Over 100 teams attend the Adidas Brandon Cup annually to enjoy the outstanding facilities, fun competition, and festive environment. The Adidas Cup Club Challenge is a competitive tournament held in May of each year. The tournament is open to all competitive teams in the U8-U19 age groups. Teams compete for age group championships and clubs compete for the coveted Overall Club Championship. Over 200 teams compete annually.